Dr. Joseph V. Lambert, age 76, of Flourtown, PA, died suddenly on April 11, 2015. Beloved husband of Catherine (nee Askins), devoted father of Dr. Jennifer Lambert, dear brother of Barbara Rowan, Richard C. Lambert, and James Lambert, loving grandfather of Liam and Finn Barnosky. Also survived by many nieces, nephews, cousins, colleagues and friends. He graduated from the North Catholic High School; received his BS, Masters and Doctorate of Psychology from Temple University. 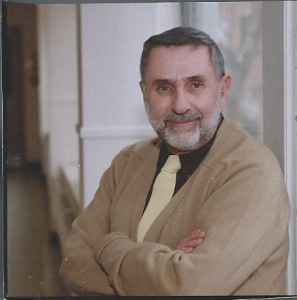 At the time of his death, he was a well-respected Professor of Psychology at the University of the Sciences in Philadelphia, a position he held for many years. Joe always will be remembered by his family, friends, colleagues, and students as unceasingly kind, caring, and always willing to lend unfailing support to others. Underneath Joe’s gentle demeanor and sense of humor was an unflagging commitment to ethics and justice. As a professor, Joe cared deeply about the quality of his teaching and the success of his students. His warm and loving spirit will be forever missed. Like the rest of us, Joe had many relationships; husband, father, brother, grandfather, professional consultant, teacher, student. For me, Joe was a mentor and colleague, but most of all, he was my friend. Our many projects and travels together were vehicles for friendship more than anything else. Joe was a thoughtful, kind and considerate person. When we first met over 40 years ago I was a beginning graduate student, a bit lost in a big city university. He took me under his wing and showed me the ropes. Joe and Cathy generously sheltered my family and me during the TMI nuclear accident. More recently, he was there with consoling words when I lost my baby sister over a year ago and never failed to inquire about my family, especially my aging mother and dad. Joe was an inquisitive fellow and a true scholar. He was eager to learn and share new findings and insights. He had a wide range of competence in his field, and had the depth to teach courses in classical conditioning, psychopharmacology, human factors design, and behavior modification. During the past 10 years we shared many adventures. We traveled to meetings, workshops and conferences together, designed and conducted experiments, analyzed data, and wrote papers together (the first one in 1974, the most recent in 2013). Our final paper is nearly ready for publication – Joe was eager to finish it. Last year, at their annual meeting, the Pennsylvania Psychological Association presented us with an award for a paper we presented there. We spent hours discussing ideas, sharing articles and talking. We exchanged countless emails and enjoyed many long phone conversations. We once drove 50 miles out of our way enroute to a conference, so distracted by our conversation. Joe was a man with high standards and integrity; you might even say “old fashioned” by today’s standards. He was deeply committed to ethical practice and professional excellence. He was honest and direct. He was not swayed by the “politically correct” and did not hesitate to speak truth to power. No “bandwagon” for Joe. He worked hard and played by the rules. He tried to do things right and set high standards. Though he didn’t strive to stand above others, he undoubtedly provided a great role model for students and faculty colleagues. Joe and I had fun together. Travel was not all business. I will remember our trip to Salt Lake City where we toured Mormon sites and attended rehearsal of the Tabernacle Choir. Joe loved ice cream…and so do I. Everywhere we went we sampled the best local ice offerings. During a trip to State College last year we ate ice cream every night for four nights. My visits to the USP campus almost always included lunch at Joe’s favorite Indian restaurant. Joe was my friend…and I miss him.